Pedigree, part of the giant Mars organisation that includes Royal Canin, Iams, Eukanuba and Nutro, have a lot of experience in the pet food market and a huge marketing budget, which explains why the brands are found everywhere. 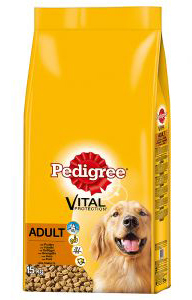 You can find Pedigree products for most common pets and life stages. But the fact is that what they offer is not necessarily the best value for what is in the bag, once you get past the brand name and bright packaging! 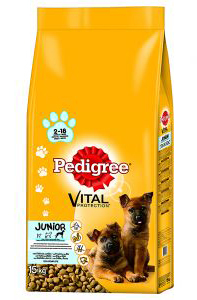 The Pedigree products should be viewd as offering a complete nutrition but not as part of the growing 'natural' end of the market. As such a pet owner needs to look around at what else is in the same sector and compare prices. Pedigree recipes are based areound mixed cereals (not all named) and meat and meat by-products with accompanying vegetable by-products. If you have a dog with a sensitivity to certain ingredients then the lack of clarity on what goes into the food might be a factor worth taking into consideration. Cereals (incl. 4% rice), meat & meat by-products (incl. 4% chicken), oils and fats (incl. 0.25% fish oil, 0.2% sunflower oil), vegetable by-products (incl. 4% sugar beet pulp), vegetable protein extracts, minerals and vitamins .